Founded in 1837, P&O Cruises is the oldest cruise line in the world. 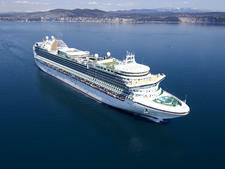 It is also the largest cruise operator catering for the British market. In 2003 it was bought by Carnival Corp. & Plc., becoming part of the largest cruise company in the world. P&O Cruises ships are easy to spot -- each one has a huge Union Jack painted across its hull. How many ships does P&O Cruises have? P&O Cruises has seven ships, with one leaving in 2019, but two more on the way; Iona launches in 2020 and an as-yet-unnamed sister ship in 2022. 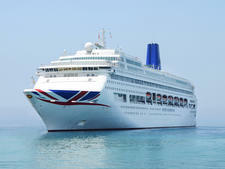 Its current fleet is a mixture of mid-sized (Oceana, Arcadia, Aurora, with around 2,000 passengers) and large -- Britannia, Azura and Ventura, with more than 3,000 passengers each. It also divides its fleet into adults only (the mid-sized vessels) and family-friendly (the others, as well as the two forthcoming ships). Where do P&O Cruises ships leave from? The ships sail from Southampton for half the year, and most of the cruises are about 14 nights in duration. However, each year its ships offer a host of shorter mini-breaks of two to seven nights. 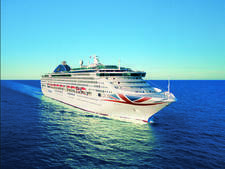 Over the winter months Britannia is based in St Lucia and Barbados as is Azura; Oceana is based in Malta and Dubai; while Arcadia, and Aurora undertake long cruises of 80 to more than 100 nights and world cruises. Where do P&O Cruises ships sail to? Ships sail to Northern Europe, including the Norwegian fjords; the Mediterranean (East and West); Canary Islands, the Azores and Madeira; the Arabian Gulf, the Caribbean and World Cruises. Are P&O Cruises ships very different from each other? P&O Cruises ships range in size from 2,000 passengers to 3,647 (Britannia), but the biggest difference is that the fleet is divided into adults only and family friendly, creating a very different vibe and feel onboard. Yet despite the size differences, the ships are remarkably similar in terms of features including popular Indian restaurant, Sindhu; the Glass House by Olly Smith and The Crow's Nest bar. When it comes to entertainment, all P&O Cruises ships have a main theatre where you'll find a selection of mainly revue-type shows with singing and dancing as well as special guests stars and stand-up comedians, all British telling very British jokes. 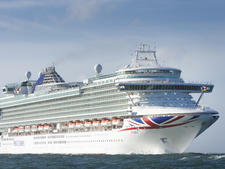 P&O Cruises also has a link up with Strictly Come Dancing, and a number of ships host Strictly-themed cruises. Where the ships vary are in smaller features -- for example, Britannia boasts the first Cookery Club at sea, and an intimate venue for a supper club-style show; while Azura and Ventura have adults-only for-fee relaxation areas. The ships vary in age, too, from 19 to four-years-old, and that shows in terms of technology, cabins and design, although regular refurbs ensure the ships all have a similar look and feel. Who goes on P&O Cruises ships? The line is aimed squarely at Brits, and that's pretty well the only nationality you'll find abroad at any time of year, wherever the ship is based. The demographic varies drastically depending on the type of ship and time of year. The adults-only ships tend to attract couples of 55-years plus; the family-friendly ones will attract families during the holiday periods, and then revert to 55+ couples outside of school holidays. Age will skew lower on the mini-break cruises to Europe and the Channel Islands. P&O Cruises is also aimed squarely at Middle England -- it's not upmarket and not "bucket and spade". The line is about as typically British as you can get. Do I have to dress up on a P&O Cruises cruise? P&O cruisers veer on the side of smart during the evening (not Cunard smart, but certainly not casual or scruffy), with casual during the day -- shorts, T-shirts, baseball caps and flip flops are perfectly acceptable day wear. On Gala nights passengers tend to make an effort and you'll see a range of clothing from ball gowns and black tie to and dark suits and long dresses and heels. What are P&O Cruises most popular activities? P&O Cruises does not go in for adrenaline-filled activities like the US ships, so you won't even find a climbing wall even on the largest ships, let alone simulated skydiving, dodgems or simulated surfing. Daytime activities across the fleet consist of Daily activities range from the old-time favourites such as deck quoits, shuffleboard and table tennis to line dancing and party dance classes plus plenty of quizzes throughout the day including a pub challenge. Is everything free on P&O Cruises? No, though you want find the rampant upcharging you get on US lines. You'll pay extra for speciality restaurants, adults-only relaxation areas, the spa (treatments and thermal suite access), alcoholic and soft drinks. From May 2019, tips will be included across the fleet. 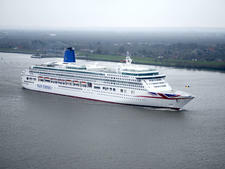 P&O cruises offeres traditional cruising aimed at British passengers. Brits aged 55+ for the adults-only ships and families for the family-friendly ships. P&O Cruises has a fleet of seven ships (as of January, 2019).